Barring intervention by the Attorney General, at best a long shot, plans to sell 40 works of art, with two paintings by Norman Rockwell worth as much as the other 38 lots, the fall auctions by Sotheby’s in New York appears to be a done deal. For the second time, Saturday, September 9, protestors will picket in front of the Berkshire Museum in Pittsfield from 10 am to 2 pm. There was a lively turnout for the first such event. Many passing cars and trucks honked their support. This time there will be the addition of speakers. Community opinions of the plan to sell and reboot the museum with child oriented interactive displays of science and natural history have been deeply divided. The museum, facing bankruptcy several years from now, argues that there is no point to saving its crown jewels if there are no walls to display them on. While professional organizations underscore the ethical violations and dismantling of a heritage some 114 years in the making, others point to the many ways that with more effective management and fiscal planning this fork in the road was entirely avoidable. MASS MoCA director, Joe Thompson, surprised many when he endorsed the decision for deaccession and extreme renovation including ripping out the historic art deco Crane room. Taking a similar position a trustee, Joan Hunter, wrote a poignant letter to the editor. The Hunter family has been widely noted for their arts philanthropy in particular through support of MASS MoCA and Jacob’s Pillow for which she has served as board president. As Hunter wrote in part to the Berkshire Eagle “The process has been difficult and painful, but I am confident in the direction the board has taken after a two year process of exploring and evaluating options. The new Berkshire Museum will utilize the collection in an interdisciplinary approach that will engage and excite all ages, and I am anxious for these details to be revealed. Meanwhile, The Clark, Mass MoCA, WCMA, and Norman Rockwell Museum complement our efforts by providing educational programs to help children appreciate and love art. Each museum serves a unique role in the Berkshires. 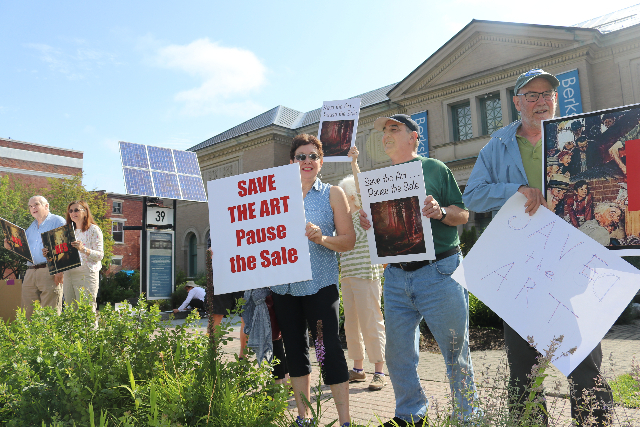 Recent reporting in the Berkshire Eagle, however, suggests that museum director, Van Shields, advised by board member Mark S. Gold, the museum’s attorney, may long have planned to monetize the collection and reshape the museum by eliminating the fine arts from its eclectic mix of collections, exhibitions and programming. There have been no significant accomplishments regarding acquisitions, fund raising, or programming since Shields took over from the widely respected Stuart Chase in 2011. The museum has slid ever deeper into the hole exacerbated by ineffective administration, marketing and pr. The museum has stated that it is being critiqued by many who are not members and rarely if ever visit. I was a frequent visitor during the tenure of Chase including numerous reviews and interviews. It was a lively program which as a critic I was committed to support. When Shields took over as director I requested an interview. At the time I was told that he was “too busy.” A year later the answer was the same. Patrons, a gallerist and artists have reported to me instances of similarly being snubbed by the museum's director. They represented offers to support and work with the museum as they had previously with Chase. There were occasional press releases and invitations to pay for openings. This is not the best way to entice media coverage. Recently, I received pr and an invitation to the opening ($10 for adults $5 for children) to an exhibition by Morgan Bulkeley. He is a Boston/ Berkshires artist I have known and reviewed for decades. He showed with Leslie Ferrin when she had a gallery in Pittsfield before moving to the MASS MoCA campus. “Humorous and ominous at the same time, Morgan Bulkeley’s active, engrossing images offer compelling scenarios where humans are pitted against nature, with nature holding the advantage. Morgan Bulkeley: Nature Culture Clash is a solo exhibition of paintings and sculptures by the Berkshire-based artist; Geoffrey Young, of the Geoffrey Young Gallery in Great Barrington, Massachusetts, is the guest curator. On many levels this exhibition is surprising. For the Berkshire Museum this is exactly the kind of programming they should be doing. The project, however, is more of an end than a beginning. A prominent work in the exhibition is a part of the museum’s permanent collection. There are a number of similar works in the collection from distinguished Berkshire artists including Stephen Hannock and Gregory Crewdson. It is ironic that these artists have direct connections to nature, the topography of Pittsfield (which Crewdson has photographed), and the Berkshire/ Hudson River Landcape traditions. In addition to the two Rockwell paintings, seminal works by 19th century Luminist painters are on the block. Looking into the future, when it is regurgitated as an interactive gizmo museum, there will be the lost potential of conflating art and natural history. For youngsters and students artists provide unique ways of looking at the natural surroundings of the Berkshires. Charging to attend Morgan's opening exemplifies ridiculous marketing and PR strategies of the museum. Every effort should be made to encourage us to see the work of one of our best artists. Instead, they want us to foot the bill for wine and cheese. That’s not the best way to convey that the museum cares about Berkshire artists. When the art world was blind sided by the decision to deaccession, rip apart the building and reboot, conspiracy theories surfaced. Recent reporting, however, confirms a basis of facts. One thesis has been that Shields is indifferent if not hostile to fine arts. There is the often mentioned qualifier that his wife is an artist. But nothing since 2011 has demonstrated an interest or commitment to the fine arts. The museum has not had a curator or collections manager for some time. Curators who left the museum have not been replaced. There has been lackluster programming for the museum’s Little Cinema. It has been suggested that when Shields first looked at the collection he saw dollar signs. That has now been confirmed. As the Eagle reported “— The executive director of the Berkshire Museum began to speak of “monetizing” the institution’s art holdings soon after arriving in 2011, according to a former collections manager. “He’d ask, ‘Why do we need all these Japanese block prints?’ ”said Leanne Hayden, who now works at a museum in Maine, of Van W. Shields, executive director of the museum. If Shields looked at the Rockwell paintings and saw a pot of gold at the end of the rainbow he had a perfect partner (pun intended) in Mark S. Gold, the museum’s attorney and an authority on deaccession law. They have indeed proven to respresent a 24 carat partnership. More than just assist the museum in its massive dumping of the crown jewels it has been discussed that Gold aspires to end forever ethical but not legally binding restriction for deaccessions. That’s why the coverage has expanded from local to national. Cash strapped museums, colleges libraries and other 501c3 organizations all over American are keenly following what happens in Pittsfield. Why, for example, hang onto Philadelphia’s Liberty Bell, which was cracked anyway? Trustees can sell it for a few millions to repair the roof or expand interactive educational programming. Sound far fetched? Not really. “To date, the trustees of the Berkshire Museum have honored the restriction on the use of the proceeds from this sale, as required by the ethical rule. Since the proceeds are otherwise unrestricted as to use, if the trustees were to apply those proceeds to fund operating or capital expenses for the museum, all in support of its articulated mission, they would unquestionably be within their legal right to do so. Shields, Gold and Elizabeth “Buzz” Mc-Graw, the trustees president, have stuck to a mantra that given the current rate of drawing on endowment to pay debt and operating expenses the museum would be forced to shut down several years from now. Professional fund raisers, arts professionals and managers have looked at the numbers and drawn different conclusions. Williams College economist, Stephen C. Sheppard, has stated that the museum would remain operational if it raised $4.5 million for its endowment. In a press conference last week he presented the results of a study projecting the economic impact and visitation surge for museum development plans in North Adams. While the ethical guidelines are not legally enforceable museums in violation are shunned by other museums. To participate in exhibitions loans and cooperation are essential. Shields has been able to nullify that with plans to get out of the art game. There are options to use what remains of the once distinguished permanent collection for in house projects. Having minimal plans for the fine arts, being boycotted by other museums has little or no leverage ethical or pragmatic. Getting out of the art game may have been a deliberate strategy concocted by Shields and Gold to avoid the potentially devastating impact of sanctions. As a science and natural science museum, however, it is a major blow to sever ties with the Smithsonian Museums. Given a track record of mediocre management and lack of curatorial vision and programming it is difficult to fathom why the slash and burn plans of Shields are being supported. With that pending pot of gold it appears that he is being given a blank check to create his vision of a museum for the next century. It is notable that Frank Gehry, a world renowned designer, has been hired to create the model train and architecture museum for North Adams while the architects for the Berkshire Museum are relatively unknown. Looking at the Berkshire Museum model there is no indication of vision let alone genius. Much has been made of the two year study that involved some 400 individuals. While names and particulars have remained secret individuals who participated have reported that they were not informed about drastic deaccession plans.The scorched earth strategy of Shields and Gold appears to have predated the study. All of the above may be an example of closing the barn door after the cow escaped. It is too late to focus on what might have been. But the timing of Shields, Gold and McGraw couldn’t be worse. There is expansion going on all over the Berkshires from Jacob’s Pillow and Tanglewood to eleven projects for North Adams. There were major renovation projects for the Clark Art Institute and MASS MoCA. This has equated to the need for more beds and an increase in the hospitality industry. Expansion in North and South counties over the next few years will benefit the economics of Pittsfield. Why didn't the museum opt for short term fund raising then sit tight for the anticipated boom? If, as Shepard has suggested $4.5 million represents stability, that seems like a reasonable goal. Why was that not explored as an option? Round that off to $5 million with $2.5 million by passing the hat around the board table then raising another $2.5 from other sources. Most Berkshire arts boards have been doing just that for decades. Arguably, they have better products to sell but doesn't that blow back on Shields and the board which has had since 2011 to get their act together? A pot of gold will not answer all of the museum’s problems. Given the current administration and board one has to ask how long even $60 million will last? Perhaps a hundred years from now the trustees will sell the butterflies. "The Guidestar document Charles uses as a basis for his article and the many good questions posed in it a document published by Guidestar. It is SUMMARY document that is based upon the Museum's public tax filing. If you want to explore the details and get answers to many - though not nearly all - these questions - see the return itself at http://www.charities.ago.state.ma.us/charities/index.asp?charities_app_ctx=details&charities_sub_ctx=entry∨igin=search&did=2628313332&bod=1505134867. This is the MA Attorney General's Office website. Since it is a financial document, it won't answer fundamental questions like, " Why did executive salaries nearly double in Four years?" (There may well be a logical answer). Or, "what was the nature of the capital loss reported?" Or, why do fund raising expenses yield such a paltry return based upon the cost/benefit ratio? It also doesn't provide any insight into why the "New Vision" is even sought after by or needed for the future? These intangibles are best put to the President and Board of Directors, not the arrogant, lying idiot CEO." "Charles, As a veteran public school educator with licenses in teaching and educational leadership, it comes as no surprise to me that science is slated to replace fine art as a survival strategy for the museum. This is a push from GW Bush right up to and including Trump, in which an obsession with reading, math, and science has trumped (no pun intended) the arts. Bill Gates, an outright advocate for school privatization, has pushed STEM (science, technology, engineering, math) onto the federal government and has gotten his way frequently because he can buy his way into revamping curriculum and standards. Therefore, art has taken a back seat; it has become the stepchild if not the orphan of cognitive pursuit . . . . It has now trickled down to the muesuem's new redesign/reboot. Berkshire Museum is making a terrible mistake, and shame on the Board for not having vetted the director, who simple "interviewed well" when he first applied for the position. Foolish is as foolish does . . . . I hope the arts can survive well. It begins with proper education and valuing the arts to be a core part of education." "Even with the Berkshire Eagle's 9/10/17 expose on Shields disastrous legacy of museum leadership in the South, one that is a mirror image of what he is now trying to do here in the Berkshires, neither Shields or his hand-picked, myopic Bored of MisDirectors will not be swayed - and the public will have little if any clout to change the course now set in stone." "Wow great example of how the wrong people in charge of a cultural resource can totally destroy it." "Dear Charles, Truth to power--or in this case, truth to the invisible power that betrays both the identity of a museum and the trust of its community." "The Berkshire art community is lucky that critic/publisher Charles Giuliano tells it like it is. Hope he keeps it up, for the good of all its institutions, participating artists, & the viewing public." "Wrong location. It will be Park Square!" "Charles, I love you. My feelings exactly. Been saying the same words all day and I have a witness."